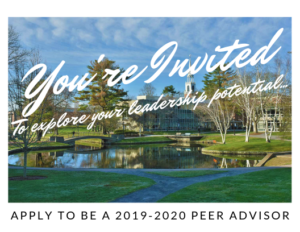 We are accepting applications for Preceptors, Peer Mentors and Student Coordinators to help shape the 2019-2020 Peer Advising program. Preceptor/ Peer Mentor due March 21st, 2019 by 5:00pm. Peer Advising Student Coordinator due March 7th, 2019 by 11:59pm. Note: To access the Google Forms, you’ll need to provide your Wheaton wID and email password. Do you have questions about the application or selection process? Please contact the Wes Boucher in the Filene Center (boucher_wesley@wheatoncollege.edu) with any questions.